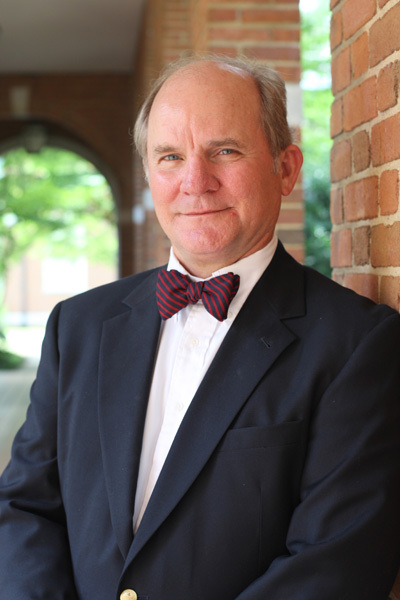 Dr. Sansom started Samford in Fall 1988 and has been Chair of the Department of Philosophy since 2000 when it was established. He teaches a wide range of classes but focuses on ethics, offering courses in Christian Ethics, Philosophical Ethics, Business Ethics, Environmental Ethics, and Medical Ethics. He primarily emphasizes the foundations of ethics, that is, the rational, cultural, and ontological conditions in which an ethical argument can be made. Such philosophers and theologians as Aristotle, St. Augustine, Kierkegaard, Kant, Hegel, Wittgenstein, and Karl Barth have influenced his particular perspectives in ethics. Furthermore, Sansom has researched and taught on how literature illustrates and helps define important philosophical concerns (i.e., what is value, meaning of death, the utility and duty of medical care) pertinent to bioethical issues, finding in such authors as Sophocles, Shakespeare, Tolstoy, John Donne, and Cormac McCarthy "real life" narratives about life and death concerns. Recently, he has researched and lectured on the ethics of embryonic stem cells for medical therapies. Sansom is the faculty advisor for Phi Sigma Tau (honor society for philosophy students), Project Africa Now and the Order of Omega (Greek honor society). As a creative outlet, he has acted in three Shakespeare plays, including Troilus and Cressida, Much Ado About Nothing, and Richard III. His biggest challenge as a hobby is lowering his golf handicap. He is married (Beverly,) has two sons (Stephen and Jonathan) and is an amateur bird-watcher and cyclist. (2009). What Do We Owe The Embryo? The Ethical Limits to Embryonic Stem Cell Research. Ethics and Medicine. (2009). Can Death be a Moral Educator: A Response to Stanley Hauerwas. Christian Scholars Review. (2010). What Do We Owe The Embryo? The Ethical Limits to Embryonic Stem Cell Research, Baptist Faith and Witness Book. (2010). Ethics and the Experience of Death: Some Lessons from Sophocles, Shakespeare, and Donne, Journal of Aesthetic Education. (2011). Truth and the World: Why Davidson Is Right and Rorty Is Wrong,. Philosophy Study. (2011). Learning from Art: Cormac McCarthy's Blood Meridian as a Critique of Divine Determinism. Contemporary Literary Criticism. (2011). Christian Ethics: How Distinctive Features of Christianity Shape Ethics, Revised Printing Kendall Hunt. (2012). A Possible Solution to the Israeli-Palestinian Conflict. Christian Ethics Today. (2012). What is the Right Thing? The Moral Instructions of Death in Leo Tolstoy's The Death of Ivan Ilych, vol. 131. Short Story Criticism, 131. (2012). What is the Right Thing? The Moral Instructions of Death in Leo Tolstoy's The Death of Ivan Ilych, vol. 141. Short Story Criticism, 141. (2012). Medicine and Human Identity in Alexander Solzhenitsyn's Cancer Ward. Ethics and Medicine, 28 (2). (2013). St. Anselm vs. the Fool (with a Little Help from David Hume): Can the Unsurpassable Be Surpassed? Saint Anselm Journal. (2013). Philosophical Approaches to Consciousness: the Legacies of Descartes, Hobbes, and Spinoza. Journal of the Alabama Academy of Science, 84 (3-4)..
Sansom, D. (2013). Codes of Ethics in Heath Care: Virtues Versus Rules. Ethics and Medicine. (2014).The Virtue of Contemplation and St. Anselm's Proslogion II and III. Saint Anselm Journal. (2014). Medicine and the Pressure of the Marketplace: Ethical Issues Involved in Medical Research and Practice. Ethics and Medicine, 30 (3). (2014). Providence and Evil: Medieval Philosophy in the Abrahamic Faiths. Scholars' Press. (2015) If Christian Ethics is Distinctively Christian, Then Can It Be A Legitimate Public Ethic?, The Journal of Faith and the Academy. (2015) Ethical Tensions Involved in Mandatory Immunization Programs: A Communitarian Response. Ethics and Medicine, 31. 3. (2016). “Curiosity Versus Studiousness: St. Augustine and the Development of Philosophical Wonder.” The Journal of Faith and the Academy, Fall. (2016) Can Irony Enrich the Aesthetic Imagination? Why Kierkegaard’s Explanation of Irony Is Better Than Richard Rorty’s. Journal of Aesthetic Education. (2017) "Prudential Versus Probative Arguments of Religious Faith: Descartes and Pascal on Reason and Faith." Religions, 8:8, July. (2017) “The Wisdom of Caritas Versus the Wisdom of Apatheia: The Contrast of St. Augustine and the Stoics Over Emotions and the Knowledge of God.” Journal of Faith and the Academy. X.2, Fall. (2018) “The Opioid Epidemic, Deadly Sins, and the Soul.” Ethics and Medicine.Spring. (2018) “Deadly Sins, Addiction, the Demonic, and Spirituality. ”Spiritus: A Journal of Christian Spirituality. Spring. (2018) “The Security of the Self: The Bazaar Versus Contemplation. The Contrast between Richard Rorty and Peter of Damaskos on the Self.” Christian Scholars Review, 47:3. Spring. (2018) “God, Evil, Suffering, and Human Destiny in the Border Trilogy: Learning from the ‘Teachers’.” University of Tennessee Press, March. (2008) "Can We Talk About God: The Place and Limits of Religious Arguments in the Public Square" at Alabama Philosophical Society. (2008) "Can Christian Ethics Be a Legitimate Ethic? An Analysis of the Relation Between The Moral Ideal and Ethical Reasoning" at Baptist Association of Philosophy Teachers. (2009). Ethics and Embryonic Stem Cells. Beta, Beta, Beta Meeting, Birmingham, Alabama. (2009). When to be Spiritual in Health Care". Health, Ethics, and the Law Conference, Samford University, Birmingham, Alabama. Sansom, D. (2010). Truth and the World: Why Davidson Is Right and Rorty Is Wrong. Alabama Philosophical Society, Pensacola, Florida. (2010). A Philosophy of Prayer: Truthful Communication and Kant and Kierkegaard on Prayer. Baptist Association of Philosophy Teachers, Birmingham, Alabama. (2010). Human Evil: A Definition. Philosophy Department Campus Seminar, Birmingham, Alabama. (2010). Codes of Ethics Are More Than Rules. They Are Virtues. Health, Ethics, and the Law Conference, Samford University, Alabama, Alabama. (2011). The Fool, Hume's Philo, and Anselm's Idea of God. Alabama Philosophical Society, Pensacola, Florida. (2011). The Relationship Between Divine Providence and Evil in the Philosophy of Moses Maimonides. The Scholars Symposium, Tantur Ecumenical Institute, Jerusalem, Israel. (2011). The Basic Beliefs and Practices of Islam. The Scholars Symposium, Tantur Ecumenical Institute, Jerusalem, Israel. (2011). The Ethics of Medical Institutional Review Boards. Institutional Review Board, Baptist Health Systems, Birmingham, Alabama. (2011). Virtue and Medical Codes of Ethics. Continuing Education, Medical Residency, Baptist Health Systems, Birmingham, Alabama. (2011). Ethical Issues Involved in Medical Research. Continuing Education, Medical Residency, Baptist Health Systems, Birmingham, Alabama. (2012). St. Anselm's Proslogion and the Virtue of Intellectual Contemplation. Baptist Association of Philosophy Teachers, Jackson, Tennessee. (2012). Baptist World Alliance--The Ethics Commission, Santiago Chile. "Response to 'Christian Spirituality, Ethics and Poverty in South Africa and Chile: An analysis of the implementation of socio-economic policies.' By Dr. Louise Kretzschmar, University of South Africa. ", Santiago, Chile. (2013). The Wisdom of Love Versus the Wisdom of Apatheia: The Contrast of St. Augustine and the Stoics Over Emotions and the Knowledge of God. The Virtue of Love--Viterbo University, Rinehart Institute for Ethics, La Crosse, Wisconsin. (2013). The Logic of Irony: An Examination of Kierkegaard's The Concept of Irony With a Critique of Richard Rorty. Baylor University Faith and Learning Institute--Kierkegaard, Waco, Texas. (2013). Questions for the IRB: Review of Protecting Research Subjects: IRBs in a Changing Research Landscape. The IRB of the Baptist Health System Bi-Annual Meeting, Birmingham, Alabama. (2013). The Conflict in Medical Research Between the Social Values of Autonomy and Market Success. Health, Ethics, and the Law Conference, Samford University, Alabama, Alabama. (2014). If Christian Ethics is Distinctively Christian, Then Can It Be A Legitimate Public Ethic? Faith and the Academy Conference: Faulkner University, Montgomery, Alabama. (2014). Is God Unlucky: A Revised Free-Will Defense. Baptist Association of Philosophy Teachers, Waco, Texas. (2014). Is God Unlucky: A Revised Free-Will Defense. Alabama Philosophical Society, Pensacola, Florida. (2014). Response to Koinonia: The church in and For the World. Comment on the Final Part of The Church--Towards a Common Vision (Faith and Order Paper 2014) by Paul S. Fiddes. Baptist World Alliance, Izmir, Turkey. (2014). Response to "Beyond milk: The moral failure and ongoing formation of lay Christian leaders in the Church and Society" by Louise Kretzschmar. Baptist World Alliance, Izmir, Turkey. (2014). Mandatory-Immunization Programs: The Necessary Ethical Tension Between Autonomy and Not Harming Public Health. Health, Ethics, and the Law Conference, Samford University, Birmingham, Alabama. (2015). Lessons from St. Peter of Damaskos: "The Eight Stages of Contemplation" in the Philokalia. Faith and the Academy Conference: Faulkner University, Montgomery, Alabama. (2015). Curiosity Versus Studiousness: St. Augustine and the Development of Philosophical Wonder. Society of Christian Philosophers, Mobile, Alabama. (2015). The Wounded Veteran and the Christian Practice of Prayer. Gateway to Hope: Breaking the Stigma of Moral Injury, Birmingham, Alabama. (2015) A Brief Word About Tristram Engelhardt's Impact on Bioethics. Health, Ethics, and theLaw Conference, Samford University, April. (2016) “Lessons from St. Peter of Damaskos: "The Eight Stages of Contemplation,” Sophia Conference, Blanco Texas, February. (2016) A Brief Word About Donald W. Light’s Impact on Bioethics. Health, Ethics, and the Law Conference, Samford University, April. (2016) “Spiritual Ethics: The Holy Spirit and Christian Ethics,” Baptist World Alliance, Christian Ethics Commission, Vancouver, Canada, July. (2016) “Philosophy and the University,” Baptist Association of Philosophy Teachers, SouthwestBaptist University, October. (2017) “The Opioid Epidemic, Deadly Sins, and the Soul.” Health, Ethics, and the Law Conference, Samford University, April. (2017) “Deadly Sins, Addiction, the Demonic, and Spirituality.” Baptist World Alliance, Christian Ethics Commission, Bangkok, Thailand, July. (2017) “Philosophy and the University,” Alabama Philosophical Society, October. (2017) “What Can We Learn from the Medieval Period?” Core Text Fall Lecture, Samford University, November.